- Access full database via App "My Location"
* We operate a strict listing criteria and businesses have to meet our dug friendly criteria 100%. Our database is about ensuring quality of listings for our members rather than quantity. Not all dog friendly businesses make it onto the site! ** All external links on listing pages are automatically checked for broken links / errors and updated in due course. All listings are also checked at regular intervals against Google places to ensure the business is not closed and the name / location is correct. ​***Please note that the iPhone App costs £1.99. The Android app is free on Google Play. The App is separate to the website however Big Dug members can log in and use an additional feature called ‘My Location’. 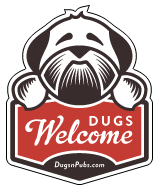 This gives you access to the full Dugs n’ Pubs database via nearest location map functionality. The Scotland, England, Wales and NI guide pages show the number of listings we have in each area. Please review these prior to signing up to ensure there are entries for your area. Unfortunately, we are unable to provide a refund for a reason related to the number of listings. If unsure, please feel free to contact us. If you have any questions, or issues while signing up, please click here for help.